These devices plug into household electrical outlets and display line voltage. Nominal AC voltage in the US is 120 volts. 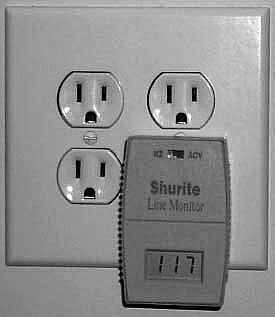 Variations of up to 10% are acceptable and will generally not have any adverse affect on electrical devices. Voltages outside the range of 108V-132V can damage sensitive equipment or appliances. 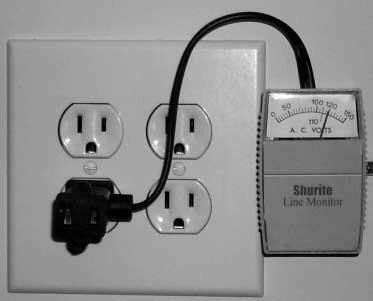 Plugs into standard home outlet and displays AC voltage. Display range limited to 90-150V for better resolution. Plugs into standard home outlet. Switch selects AC voltage or frequency for display on digital LCD readout.